I really had zero expectation for my trip to Amanbagh at the city of Ajabgarh. Well, technically, it's right outside of Ajabgarh. After flying into Mumbai via London from New York, then transferring to an Indian domestic flight from Mumbai to Jaipur, I was about dead after the long flight and lay overs...24 hours so far... Amanbagh had sent a driver to pick me up from Jaipur airport to the hotel. The drive was about 2 hours long. This is the first time for me in India so I didn't know what to expect. Soon enough, our car was sharing roads with cows, sheep, camels, dogs, and everything in between! It was an interesting drive to say the least. Once I arrive at Amanbagh, the staff gathered to welcome me. A lady came out singing in Indian language and right away tone was set. It was a fantastic way to give you a sense of place. I received a garland of marigold and was accompanied to my pool suite. In side the main structure, Aman had hired a flutist playing traditional Indian music. Amanbagh definitely know how to create mood. On the way to my suite, I saw an absolutely gorgeous pool in the middle of the property. It was stunning. And throughout the walk, I can hear birds singing. I felt like I was in some kind of paradise. My suite was equally as beautiful as rest of the property. A small courtyard acted as a segregation device to separate public walkway and my villa. Once inside my villa, I can choose to go to right which is sleeping quarter or left which is bathroom and closet area. Decoration at Aman properties is typically fairly sparse. This is done to their advantage IMO as interior design, like fashion, does age as time progress. The less decor you have inside a place, the harder it is to date an interior. Hence most Aman properties have a timeless feel to them partially because they lack intricate interior decoration. This can be good and bad depending on individual. For me, I appreciate their more austere aesthetic. In this particular case, I would say this is a more elaborated decorated Aman suite than other ones I've seen. Behind the property, you have an outdoor eating area and a decent size swimming pool (ie bigger than dipping pool which one typically see at resorts). I did see some water damage on roman shades. I'm assuming because of the yearly monsoon season, this is inevitable. Of course Aman can have the drapery cleaned yearly, but I'm assuming it may not be cost effective? Nonetheless, the villa had luxurious feel to it. I was very happy with it. The biggest draw back for me is traffic sound which you can hear when you are outside your villa. Now my villa is far away from the main road that traverse through this part of the world. However, occasionally, you will hear Indian music being blasted by a truck driving by. The juxtaposition of birds chirping and Indian music is a bit jarring but I suppose that's part of the charm of the place. The food at the resort was very fresh. Most vegetables, if not all, are from their organic garden. The quality of the food was very good. While it was not one Michelin star level, I would say the sophistication was just a notch below one Michelin star. Their naan bread was delectable. The best I ever had. I can eat those naan all day long. Another benefit of eating at Amanbagh is you can safely eat their salad as you don't have to worry about water contamination/ pesticide with their vegetable. Ice cubes at Aman properties in India are also made by filtered water so there is no worries on that part. All in all, this Aman probably has the best food at any Aman properties I have ever stayed at. What set Aman properties apart from all other luxury resorts is their cultural activities. They give you a set of activities you can choose from if you decided you want more than just spa treatments and doing absolutely nothing. 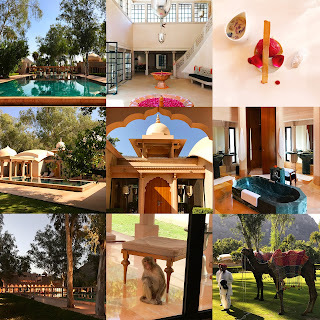 For me, I chose to do the following: Bhangarh Visit, Aarti at Barakhambi Temple, Needlkanth Temple followed by Mansarovar Lake, Camel Ride followed by Cow Dust Tour, Maharani Massage, Pratapgarh Fort, and Chhatri Dinner. While sounds like I was everywhere and doing everything. Truth of the matter was in no time did I feel like I was rushing through any of these experiences. In fact, most of my day there didn't start until after 1PM. My very favorite activity of the bunch was Pratapgarh Fort. It's only about 30 minutes car ride from the resort and it's EVERYTHING. The fort is high up on a small mountain and the only way up is trek up a gravel hill. When you get near the front entry point near top of the mountain, there are some stairs that were constructed recently. Otherwise you are just scaling up 30-45 angle gravel path...not for people with weak knees for sure. Once you get up to the 18th century fort, you have a commanding view of the surrounding towns and valleys. The view is majestic and the fact that my group was the only people up there is just fantastic....no people talking...no flashes going off people's phones like at Taj Mahal. It's just silence with occasional bird chirping and wind blowing. I feel like I'm in a role playing game like Zelda and traveling through an abandoned fort on my way to find treasures! With regrets that I couldn't stay longer than few days. All good things must come to an end. I shall return someday. Hopefully soon.